Starting in 1961, dealer plates became annual issues – the plates were replaced every year. The colors were blue on white for odd years, and white on blue for even years. This practice continued through 1980. The year of expiration was stamped into the plate. Also, I thought it would be neat to line up all of my one- and two- digit new car dealer plates. I don’t have many yet, but if you have one I need which you’d like to sell or trade, let me know! See them here. Another 1977, with the numbers/letters justified to the ends as was the standard practice until 1977. This was not common for the 1977 plates; most are centered. 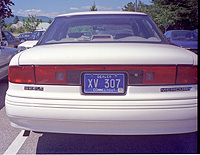 Starting with the 1986 decals, New Car Dealer plates had differently colored decals from Used Car Dealer plates.